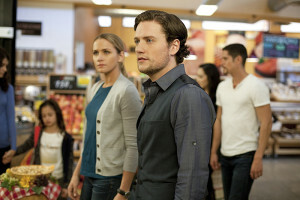 The Messengers Preview Images: "A House Divided"
Surely it won’t be the ratings grabber that the Dallas episode “A House Divided” had, but that is still the title for the June 5 episode of The Messengers. Here’s how The CW describes it; photos follow below. GIFTS ARE NOT WITHOUT CONSEQUENCE — The Messengers struggle to stay together and on mission when an unforeseen setback causes them to question whether being an Angel is causing them more harm than good. In the process of pursuing their own desires, the Messengers discover that destiny has a strange way of bringing them back together. Diogo Morgado, Shantel VanSanten, Craig Frank, JD Pardo, Sofia Black D’Elia, Jon Fletcher, Anna Diop and Joel Courtney also star. Paul Kaufman directed the episode written by Harrison Weinfeld and Daniel Zucker (#108). Original airdate 6/5/2015. The Messengers -- "A House Divided" -- Image Number: MES108A_0267 -- Pictured (L-R): Sofia Black-D'Elia as Erin and Madison Dellamea as Amy -- Photo: Cathy Kanavy/The CW -- ÃÂ© 2015 The CW Network, LLC. All rights reserved.